Inspired by the arrival of the much anticipated and much apreciated warm spring weather, our new Dipity Dough is called “Springtime Bliss” for good reason. And yes, it is also off the chain crazy delicious! We took a big scoop of our Coconut Almond Bliss (smooth coconut ice cream with almond and chocolate chunks) and put that in between two warm Pineapple Upside Down Gooey Butter cookies. You gotta try the "Springtime Bliss!" Our latest and greatest Ice Cream Sandwich. Inspired by St. Patrick's Day, Serendipity Ice Cream’s Dipity Dough of the Month (for March) is called a Lucky Choco O'Minty. It is made with a scoop of our Mint Chip Super Premium Ice Cream and then warmed between two freshly baked Chocolate Cookies filled with chopped Andes Mints. Let's just go ahead and say that this particular Ice Cream Sandwich definitely sham-rocks! 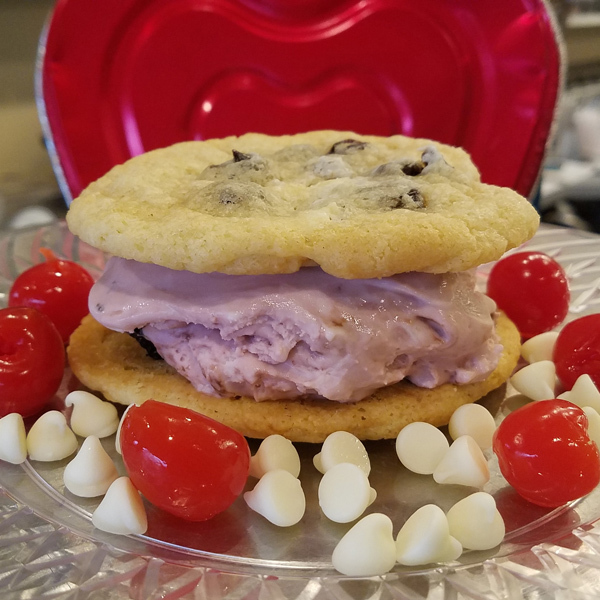 With Ice Cream for Breakfast Day (the first Saturday in February) and then Ice Cream "Conversation Hearts" Cakes (for Valentine’s Day), all of us have been negligent in promoting our “Dipity Dough of the Month” (custom ice cream sandwich). 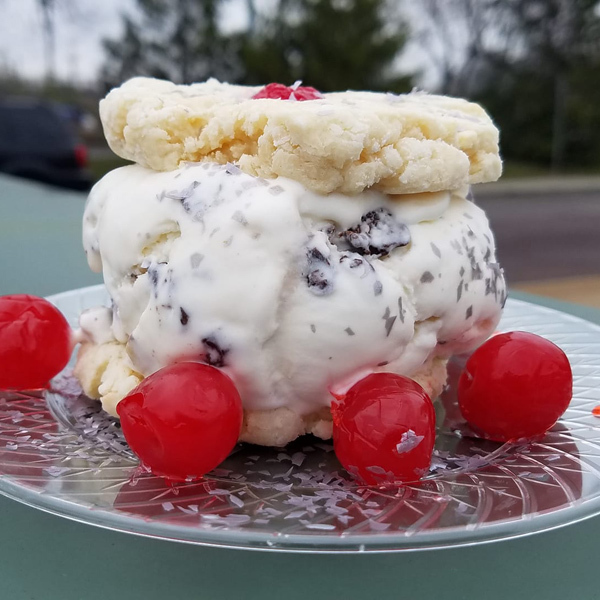 We are currently offering a Cha Cha Cherry, which is made with a scoop of Black Cherry Ice Cream and inserted between two warm, freshly made Black Cherry White Chocolate Chip Cookies. It’s worth chopping down a cherry tree for! I am proud to say that I have been serving up ice cream at my shop at 8130 Big Bend Boulevard in Webster Groves for 15 years, as well as selling my ice cream to local restaurants and retailers. I have enjoyed making and selling the BEST ice cream in the area. Recently, I inked an agreement with The Chocolate Shoppe Ice Cream Company in Madison, WI, to provide super-premium ice cream in my shop and to my local wholesale customers. The reason is simple, yet complicated. The FDA's Food Safety Modernization Act (FSMA) went into effect for very small businesses like Serendipity in September. The regulation imposes additional stringent standards on wholesale food production, impacting many local purveyors' ability to provide products for resale. I first heard about FSMA a couple of years ago. Since then, I diligently researched the requirements and completed the FDA's training – just like when I opened in 2003. Once I realized how much FSMA would impact every aspect of our wholesale production of ice cream, it became clear that spending hundreds of thousands of dollars to upgrade my production facilities to meet the new standards would not be the best business decision. Fortunately, I was approached by The Chocolate Shoppe Ice Cream Company, a family-owned and operated company that has been making award-winning ice cream for more than 50 years, to serve as a new supplier for my shop and the many restaurants, hotels, and country clubs I serve. My first priority has always been serving the most delicious ice cream for our customers. When I tried their super-premium ice cream many years ago, I was blown away. The taste and quality are better than anything else I’ve ever tried. Outside of my own ice cream, theirs is the only ice cream good enough for my customers. Plus, since The Chocolate Shoppe Ice Cream Company already meets the FDA requirements for FSMA, I feel confident that the switch will allow me to continue to delight customers, both in my shop and at the many locations that proudly serve Serendipity ice cream. Serendipity is the only retailer and distributor of The Chocolate Shoppe Ice Cream Company ice cream in St. Louis. Chocolate Shoppe Ice Cream starts with 100% natural base mix made with pure cane sugar and natural stabilizers. Many flavors are 100% natural. If you notice that the ice cream reminds you of gelato in Italy, it’s probably due to the extremely low amount of air in the ice cream. For those who are interested, the ice cream is also Certified Kosher by the Chicago Rabbinical Council. I will carry up to 13 flavors of Chocolate Shoppe ice cream, but don’t despair! Serendipity will still make Cookie Monster and Gooey Butter Cake, which will now be available EXCLUSIVELY in my shop. Enjoy them by the scoop or in Serendipity’s Dipity Dough custom ice cream sandwiches, sundaes, Spirited Shakes, and other specialties. I truly appreciate all of your support over the past 15 years. I invite you to stop by the shop and check out the new flavors for yourself. I hope you love them as much as I do!